The Christmas season is always our best time of year, and every year we have one or two products that are our top sellers. Last year it was the horseshoe barbecue sets. This year it was fire pokers and stocking hangers. The top seat always seems to change depending on new products and adjustments in pricing. I had to raise the price on the barbecue sets because of the time it truly took me, but finding that sweet spot on pricing is difficult, I priced myself out of the market. I have been making fire-pokers for sometime now but this year they seemed to really take off. I had a handful of custom orders for fire pokers in some very surprising lengths. The longest one I made was 60 inches and was shipped to Canada, it looked like a whale harpoon it was so big. Setting up the listing on our Etsy Page has been a bit of a challenge. I offer three different handle types and with the wide variety of lengths people prefer Amy has had her hands full trying to build the best listing options. Adding customized initials to that was quite the SNAFU, but we figured it out and now we are happy to offer the addition of stamped initials to the handles of our fire pokers. In the past I have been forging the tips of the pokers, then welding them with my electric welder, then forging them again. 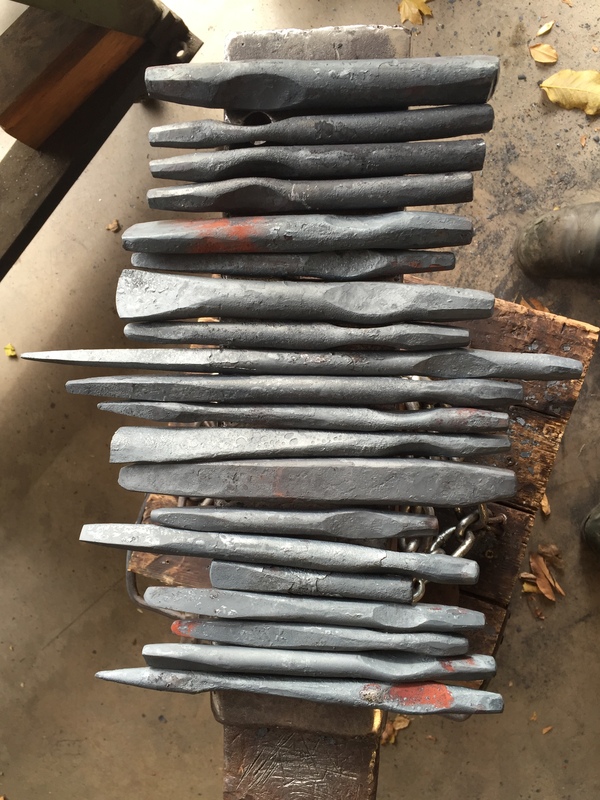 This year I started forge welding the tips at my friend’s house in his coal forge. It’s more efficient for me to drive 20 minutes, spend a hour forging out a half dozen tips then it is to do did it at my house with an electric welder. The surprise product for the year were the stocking hangers. Amy suggested I add them to our product line so I knocked out a jig and made a few. They started selling so well I had to order more stock two additional times in order to meet the demands. I added an additional style and two sizes to each. With the amount of attention they are still getting on a weekly basis I am anticipating they will be a popular item next fall.